Coupes based on compact sedans aren’t a new trend, but it does appear this particular breed of automobile is gaining in popularity. Cadillac and Mercedes-Benz offer two-door variants of their four-door ATS and C-Class models respectively, and the likes of the Audi A5, Lexus RC and Infiniti Q60 share plenty of components with their sedan stablemates. As a result, the rise of the BMW 4 Series (based, unsurprisingly, off the BMW 3 Series sedan) shouldn’t be a massive shock. Equally, it’s no shock to learn that the BMW 4 Series is also quite the well-rounded executive coupe, with plenty of appealing aspects to list off as selling points. That said, the BMW 4 Series is far from perfect and – as we’ll discuss in detail throughout this review – there is a case to be made that the car is incredibly expensive by class standards. We still think the BMW 4 Series has a pleasant-enough interior that goes some way to justifying the car’s $42,000 base sticker price. Considering the car it’s based on has been on sale since 2012, the BMW 4 Series is perhaps unsurprisingly lacking in some aspects when it comes to the interior. With most of the vehicle’s rivals being relatively recent additions to the compact executive coupe market, it’s understandable to learn the BMW 4 Series isn’t quite the pinnacle of interior design and build quality in this sector. Don’t get us wrong: we still think the BMW 4 Series has a pleasant-enough interior that goes some way to justifying the car’s $42,000 base sticker price, and it’s certainly feels well screwed together. However, in light of more up-to-date rivals (namely the Mercedes-Benz C-Class and Audi A5), the overall quality of the materials and the design of the interior is starting to feel rather dated. Thankfully, there are areas that make up for this, with ergonomics being perhaps the most obvious of them. All the major controls are logically laid out and intuitive to operate on the move, and the positioning of the main multimedia display right on top of the dashboard means your eyes never stray too far away from the road ahead. Perhaps the highlight, though, is BMW’s iDrive system, which – via a combination of the rotary dial interface and the menu design – still ranks up there as one of the best examples of an infotainment setup in an executive car in this class. The BMW 4 Series has one of the largest cargo areas of any vehicle in this segment. Sadly, things do go a bit downhill with regards to practicality. Though head and leg room is surprisingly decent all-round for a two-door compact executive coupe, it’s nothing to really write home about, and taller passengers in the back will need to make do with a compromised amount of head room. Also of disappointment is the lack of storage compartments around the cabin: only the door bins and the glovebox are of a decent size, and the only other useful cubby facilities in the BMW 4 Series are the pockets on the backs of the front seats. At least trunk space is legitimately impressive by executive coupe standards. At 15.7 cubic feet in capacity, the BMW 4 Series has one of the largest cargo areas of any vehicle in this segment, and is considerably more than what the class stragglers can muster (the Infiniti Q60 and Lexus RC, for instance, only provide 8.7 and 10.1 cubic feet of space respectively). Better still, 40:20:40 split-folding rear seats are available across the range, and the seat backs fold away almost completely flat. The BMW 4 Series isn’t the out-and-out class leader in this segment. It shouldn’t be surprising to learn the BMW 4 Series is a very pleasant vehicle to drive. After all, BMW’s official tagline is “The Ultimate Driving Machine”, and several of the firm’s vehicles have been ranked as some of the finest cars to drive in their respective segments. What perhaps is a little bit unexpected, though, is the fact the BMW 4 Series isn’t the out-and-out class leader in this segment. For sure, in many ways, the 4 Series is a poised and balanced coupe with an admirable ride/handling balance, but the truth is the BMW isn’t quite the top tier vehicle its 3 Series Coupe predecessors used to be. For starters, though we do feel the juxtaposition between ride and handling is well-judged in this segment, the BMW 4 Series isn’t the only vehicle in this segment with that ace card up its sleeve, with the most obvious example being the Cadillac ATS Coupe. Likewise, though the BMW 4 Series is still a comfortable and refined car, the likes of the Lexus RC and the Mercedes-Benz C-Class Coupe do a marginally better job at isolating the driver and passengers from bumps in the road surface and more abrasive noises like wind whistle and tire roar. The BMW 4 Series is quite easy to place on the road confidently. Admittedly, the margins aren’t massive, and the BMW 4 Series does still strike a great balance between being fun and comfortable. But there’s no denying the fact rival cars have made some serious strides as of late, and those core BMW unique sales points aren’t quite as novel or as exclusive as they used to be anymore. That said, there are still areas where the BMW 4 Series genuinely has a march on rivals, with all-round visibility being one of them. Bar some slightly chunky rear pillars, the view out back is very good indeed, with the remainder of the glasshouse also being equally impressive. As a result, the BMW 4 Series is quite easy to place on the road confidently – though, if we’re being honest, we would prefer the ease of use that comes with having a reversing camera, parking sensors and blind spot monitoring (all optional extras on the BMW 4 Series) fitted onto the car. Thankfully, the other unit option – a 2.0-liter turbocharged four-cylinder gasoline engine. Let’s make no mistake: in a money no object scenario, the 3.0-liter six-cylinder gasoline engine is arguably the unit we’d advise BMW 4 Series Coupe buyers to consider. In many ways, it’s a brilliant all-round engine, with its smoothness, refinement and surprisingly (considering the engine is turbocharged) linear power and torque delivery makes it an exceptionally user-friendly and drivable engine – especially if you don’t go for the ‘xDrive’ BMW 4 Series models that ditch the rear-wheel drive setup for all-wheel drive. It also helps that the 3.0-liter engine is also pleasantly punchy. With 300-hp and 300 lb-ft of torque on tap (the latter being accessible from 1,500rpm all the way to 5,000rpm), there’s ample grunt and pulling power on tap. Better still, the eight-speed automatic transmission changes gear so swiftly and smoothly that we feel it further accentuates the potency of this engine, to the point where we’d reckon only those who crave the extra interactivity that comes via the optional six-speed manual transmission (which, for the record, is only available on rear-wheel drive 4 Series models) should disregard the eight-speed automatic. As the BMW 4 Series Coupe becomes a $48,000+ car when specified with the 3.0-liter engine, though, such a specification isn’t exactly ideal for most buyers. Thankfully, the other unit option – a 2.0-liter turbocharged four-cylinder gasoline engine – does prove itself to be a mighty fine alternative for those with less disposable income to play with. With an automatic transmission and rear-wheel drive fitted, it’s allegedly possible to return 23mpg in the city and 35mpg on the highway. For starters, whilst it’s not quite as smooth as the six-cylinder, the four-cylinder is still a refined engine that works rather well with the eight-speed automatic transmission. Plus, the 2.0-liter doesn’t sacrifice that much in outright grunt compared to the 3.0-liter, with the four-cylinder engine generating 240-hp and 255 lb-ft of torque. By most measures, they’re fairly good outputs considering the size of the engine, and are more than enough to endow the BMW 4 Series with the straight-line pace that befits a sportier executive coupe. And, of course, the smaller engine does bring about benefits with regards to fuel consumption. With an automatic transmission and rear-wheel drive fitted, it’s allegedly possible to return 23mpg in the city and 35mpg on the highway, which is pretty good by class standards. Better still, the penalties for adding manual transmissions and all-wheel drive isn’t too steep: in general, swapping out the gearbox and having an extra pair of driven wheels only reduces the city and highway economy figures by one mpg. It’s worth pointing out, though, that the 3.0-liter is still fairly frugal. In its most efficient guise, this more powerful option can return 20mpg and 31mpg in the city and on the highway respectively, with similarly slim reductions in efficiency when you add manual transmissions and all-wheel drive to the equation. 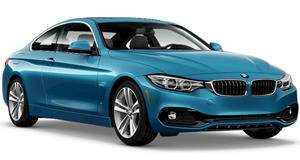 With a starting price of $42,150, the BMW 4 Series Coupe was already one of the more expensive offerings in this class. All in all, the BMW 4 Series Coupe has proven to be quite the likeable machine. For sure, there are some faults here and there, but overall the BMW 4 Series is a well-rounded vehicle that covers most of the bases to a pretty good standard. Sadly, this is the point in the review where our opinions on the BMW 4 Series Coupe start to become noticeably sour. Primarily because, in certain areas and scenarios, the car can become a rather pricey compact executive coupe. 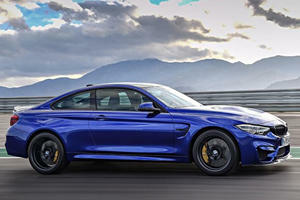 With a starting price of $42,150, the BMW 4 Series Coupe was already one of the more expensive offerings in this class. Though some rivals are admittedly pricier (the Mercedes-Benz C-Class Coupe, for example, retails for a few hundred bucks more than the BMW), there’s no getting away from the fact other competitors are noticeably more affordable. For instance, with a starting price of just under $38,000, the Cadillac ATS Coupe is a relative steal in comparison with the 4 Series. It also doesn’t help that the BMW 4 Series isn’t amazingly well equipped for a car at this price range. Leather upholstery, for example, is a $1,450 optional extra, and you’ll need to pay extra for features like parking sensors, a reversing camera, heated front seats, built-in navigation and Apple CarPlay connectivity. Even lumbar support for the driver’s seat is an optional extra! The BMW 4 Series Coupe also comes with a fairly-decent-by-industry-standards four-years/50,000-miles bumper-to-bumper warranty. Worse still, a lot of these features are only available in specific option packages. Though Apple CarPlay functionality, heated front seats, built-in navigation and (a rather excellent, if we may add) adaptive suspension system are all standalone, you’ll need to go for a $950 Driver Assistance Package if you crave a reversing camera, and a staggering $2,200 on a Premium Package just to have access to lumbar adjustment. That’s not to say BMW has scrimped everywhere, though: dual-zone climate control, power-adjustable front seats, adaptive cruise control and adaptive headlights are all standard equipment, regardless of which BMW 4 Series Coupe you go for. Still, it’s a genuine shame that so many features you’d expect to find standard on a car of this ilk being side-lined to the options list – and some held ransom behind some incredibly expensive packages. At least residual values should hold up fairly well, and the complement of airbags and stability systems does mean the BMW 4 Series Coupe should be a very safe and secure car (for reference, the BMW 3 Series on which it’s based has scored five stars in its most recent NHTSA crash tests). Plus, the BMW 4 Series Coupe also comes with a fairly-decent-by-industry-standards four-years/50,000-miles bumper-to-bumper warranty. It’s a shame that the BMW 4 Series Coupe is such an expensive vehicle. Not only does it make the car difficult to recommend (load the BMW up with all the options we mentioned earlier, and you’ll have yourself a car that’s edging towards the price range of executive coupes from the class above), but the pricing issues are genuinely the only big beef we have with the BMW 4 Series. Yes, we do wish the interior wasn’t as dated or lacking in storage compartments, and there are rivals that provide more levels of comfort and refinement than the BMW, but the rest of the 4 Series when you take the price out of the equation does go some way to redeeming those drawbacks. With this pricing structure, then, we can only genuinely recommend the BMW 4 Series Coupe if you either have the available funds to afford the car, or reckon the rest of the car’s package justifies the premium. If you don’t fall in either category, then we’d advise you consider one of the BMW 4 Series Coupe’s less expensive rivals. 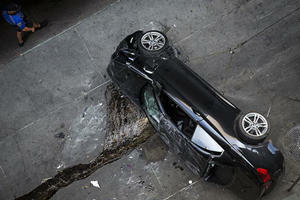 This isn't even the first time this type of accident has happened at the same parking garage. Meanwhile Mercedes keeps getting further ahead of poor BMW. 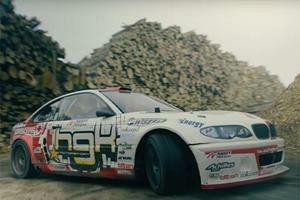 No CGI here. This is the real deal.